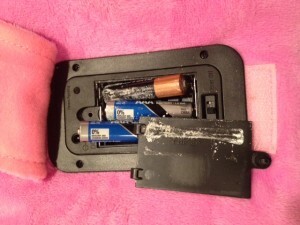 This is the battery area on a Pillow Pets Dream Lite, in a photo sent to Carr & Carr by a concerned mother. This could have easily turned into a dangerous fire on a children’s toy. If your child has been injured by a Pillow Pets Dream Lite, save the defective toy where your child can’t get to it, and then call Carr & Carr Attorneys to see if you have a case. Just a couple of days after we posted a blog regarding problems we have learned about with Dream Lites Pillow Pets, we were contacted by a concerned mother. Fortunately, her daughter was not injured by the product, but look what she found as she started to replace the batteries; just imagine what tragedy could have occurred. As of the date of this posting, these stuffed, lighted toys are still available for purchase from retailers such as Walmart and Amazon. Pillow Pets Dream Lites is manufactured by Ontel Products. In May 2013, the company was notified through the Consumer Product Safety Commission (CPSC) from a parent who stated that her child’s Pillow Pet partially melted when it was left on overnight with her child, even though the mom made sure that the automatic turn-off timer was turned on. While it is unclear what is causing the batteries to overheat, it is obvious that this is happening too often and putting children at risk of injury. Please call us at 1-877-392-4878 or email us immediately if you or someone you know has been hurt or sustained property damage from a fire and want to visit with us about compensation for damages caused by it. Further, if the product is shown to be unreasonably dangerous, it is possible to work towards having the product line removed from store shelves. If the product malfunctioned, keep it in a place away from children as it can be very important to have on hand to prove what happened. Remember, there are deadlines, which vary by state or federal law, to give certain notices and file a law suit. Failure to meet these deadlines can result in untimely claims for compensation being denied. Carr & Carr can help injured people anywhere in the United States, regardless where you live. We do not charge anything for an initial consultation. Call today if your child has been hurt.